This is the most advanced guide about SiteGround and Bluehost. I’m going to show you their unique features, comparison, pricing and offers that can help you choose the best web hosting service for your business. Also, i’ll show you how you can promote your website with email marketing. In short: If you want to choose the best web hosting provider, you’ll love this guide. Note: Some of the links below are referral links. Which means that if you choose to signup, I will earn a commission. I recommend them because they are helpful and useful. Please do not spend any money on these services unless you feel you need them or that they will help you achieve your goals. Please read our disclosure for more info. First, 14 web hosting services to avoid at all costs. When I started blogging online, I tested the below services and most of them let me down. That’s why I decided to invest in paid web hosting services. As it turns out there are a handful of web hosting services that simply do not give you value for your time and money. Before I talk about SiteGround vs Bluehost, let me quickly show you web hosting platforms to avoid. When it comes to hosting your blog, free webhosting platforms are a waste of money. As we all know, you get what you pay for. When I first got into blogging, I loved Blogger.com. I even built my first blog on Blogger.com and earned some money through Google AdSense. But I could not manage the blog simply because the platform is not self-hosted. They used to work GREAT, but those days are long gone. That’s why I recommend steering clear of most “Free Webhosting Services”. SiteGround is a web hosting platform that provides shared, cloud, dedicated hosting servers, email hosting and domain registration. Additionally it’s a hosting provider that is trusted by over 1.9 Million domains worldwide. Small business owners and Entrepreneurs. Below are some of the top entrepreneurs who are using SiteGround. They’ll give you support you need to launch your website. They have professional experts who can help you transfer your website without any hitches. They are flexible when it comes to WordPress developing. For starters you’ll be introduced on a special price of $3.95 to $11.95. Once you start being a regular customer, you’ll be charged a monthly price of $11.95 to $34.95. See below their pricing plan. Note: As I said earlier, SiteGround is best suited for small business owners and entrepreneurs. They run latest PHP versions. They have an in-built AI software that prevents over 5 million brute-force attacks every day. They have an active team that monitors any security vulnerability every single day. Their uptime is 99.9%. They have an inbuilt tool where you can check your real time status. They have an active customer support i.e. you can Log in a ticket and it will take less than 10 minutes to be replied. Additionally, they have a live chat that is active 24/7. It’s one of the hosting providers that has been officially recommended by WordPress.org. They give automatic system updates. It’s expensive as compared to Bluehost. If you’re an entrepreneur, I’d recommend you sign up with SiteGround. Now that you have seen what SiteGround offers, let’s look at Bluehost hosting provider. Bluehost is a web hosting company that powers over 2 million domains. It was founded by Matt Heaton in 2003. It’s also a secure and reliable hosting provider that is trusted by millions of people who use it to start their own blogs. 1. Choose a plan based on your needs. 2. As an example let’s choose a basic plan. 3. Choose your free domain or you can transfer your existing domain. 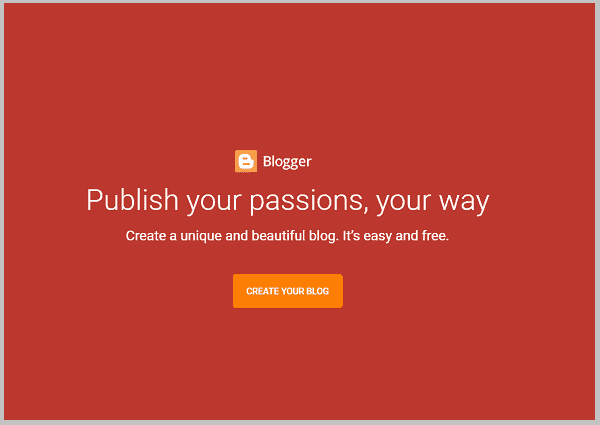 Its best suited for bloggers, marketers and freelancers. 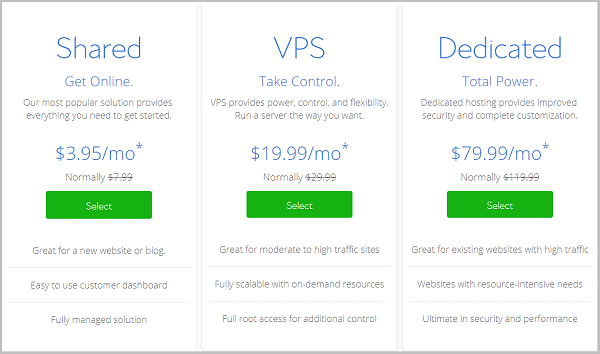 So what does Bluehost offers? As an addition you’ll get 20% off when you sign up. They have a full service design and marketing. They can also help you set up a web store for your ecommerce business. When you compare SiteGround pricing with that of Bluehost, you can see why Bluehost is the best hosting provider for bloggers and freelancers. 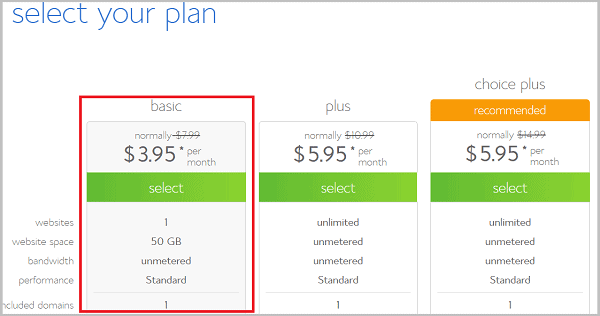 Bluehost starts from $3.95/mo to $79.99/mo depending on the hosting plan. See below their pricing plan. They have a fully managed WordPress hosting that can supercharge your business. Their WordPress hosting is secured and reliable. Its speed cannot be matched with that of SiteGround. It doesn’t have a staging area. It does not have an in-house catching system. You have to purchase, download and install. It has 1 sever location in USA. As you can see there is a big difference between SiteGround and Bluehost. It all depends with your needs. If you’re a blogger and you want to start a blog on a tight budget, then I’d recommend you sign up with Bluehost. Now that you’ve selected your best web hosting provider for your website. You need to think on how to promote your blog. From my own experience I’d recommend email marketing. Just like many other people, I had also started wondering that email marketing is dead now. I used to believe that it will not work in today’s time when people have no time for checking promotional mails. It was obvious to think because other digital marketing techniques were being widely used by the marketers across the globe. Even though my thoughts were negative about email marketing, the recent statistics surprised me. People send over 74 trillion emails every year across the globe. This number is increasing with 1.8 million every year since 2016. Let’s focus only on the USA, about 85% adults send and read their emails every day. So, what does it prove? It simply proves email marketing is not dead and it can still be an impactful way of promoting brands, products, services, and the whole business. Where do things go wrong when running an email marketing campaign? Email marketing can offer your website with a great competitive advantage if managed perfectly. Am I sending emails to prospects only to get nothing in return? Do the people in my email marketing list open all the emails I send? Does the target audience open my emails only to delete them? Where is my email marketing campaign is going, is it going in a right direction or in a wrong direction? There are email marketing tools such as Mailchimp and Constant Contact which are used widely by the marketers while running an email marketing campaign. I think it is a great way of entertaining your clients, potential customers, and vendors. Things go wrong when you start sending too many irrelevant and unnecessary emails. People may soon get frustrated and mark your emails as spam. Once you got in their spam box, you can never engage that person with any lucrative offer. You should not take such risks because nobody wants to do a business with a spammer. How to run an email marketing campaign for faster results? Every person invests money in a marketing technique when he is sure about positive results. I assure you that you will generate higher ROI for your business or client if you follow the below listed email marketing tips. I am strictly against buying a prefabricated email list. What is will you gain from sending promotional mails to people who have nothing to do with your business. Many individuals are making money by selling such lists and spoiling email marketing efforts of small and medium sized businesses. Encourage people to sign up for your email newsletter and get in touch for constant updates on new offers. Thus, you will get genuine prospects for growing your business. Most of the people delete emails right after opening it because they find subject line boring. You should encourage your readers to read and reply. Offer something unique with each new email. Offer a personal touch to your emails so that the reader will believe it is from a person and not from a machine. The content should be meaningful and targeted. You should segment each person on the email list depending on his interest in your products and services. Thus, you can make things interesting for all your readers. Even though you have got email addresses from the subscribers, all of them may not be in the mood of opening an email. Most of the users simply avoid emails sent by companies. I strongly believe that people will take more interest if you try to make your emails personal. 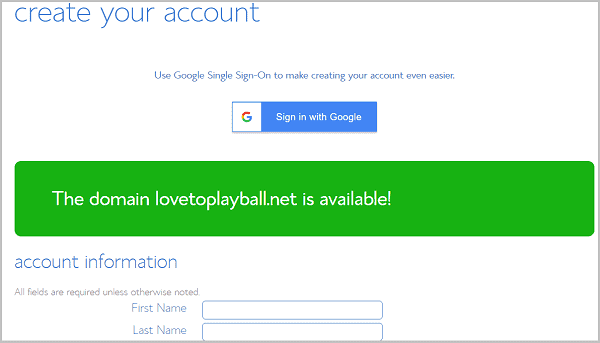 Add your name at the end of the email or use email accounts that look personal. Thus, more people will pay attention to what you are saying and they will possibly take an action after reading the whole email. Email marketing is all about being in touch with the customers and prospects. Your customer should never forget that your business care about their demands. There are email marketing software for small business owners who cannot afford to hire a digital marketing firm. Use this tool by following the above listed tips. Thus, you will be able to keep your promotional emails out of the spam box. Yes, I have said that your emails should not look machine generated mails. It mainly depends on the content you are using in each mail. Use fresh content and add new offers in each email. Thus, you will certainly engage more and more customers and this whole approach will help you in increasing your sales. Try what I am suggesting because these tips and tactics worked for my email marketing campaign. So those are the unique offers and comparisons between SiteGround and Bluehost. As you saw, there are pros and cons of each web hosting sites. If you want to be a freelancer or a blogger, i’d recommend Bluehost but if you want to go beyond being a blogger, then SiteGround is the best choice. These are definitely your best web hosting services. What’s your experience between SiteGround vs Bluehost?Let me know your thoughts below. Thanks for the detailed review. Truth to be told, I have never used nor Siteground nor BlueHost. When I wanted to become an affiliate with Bluehost, I had to wait for an hour to be available to chat with an agent. That’s not the best customer service that a company like BlueHost should give. Or maybe I just went through rush hours. For Siteground, I only heard good words about it so I think I am gonna try for a project that can be a good hit (viral site). 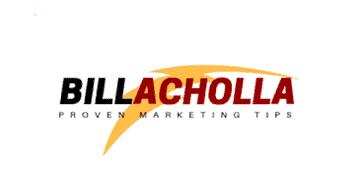 Btw I only use reseller hosting, as I have to host all niche sites of mine and client’s site. You’re right Melos, Bluehost customer service not extremely fast. Siteground is a good one the only challenge its a bit expensive.